The Kochen–Specker 1 (KS) proof (see here for theory) demonstrates the impossibility that quantum mechanical observables represent elements of physical reality. More precisely it stresses the incompatibility of quantum mechanics with a class of hidden-variable theories, known as noncontextual hidden-variable theories (NCHVTs). 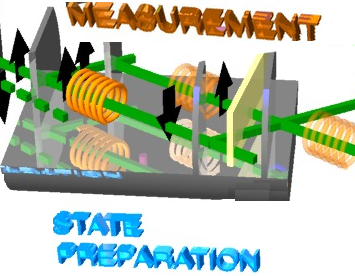 By definition, NCHVTs assume that the result of a measurement of an observable is i) predetermined, consequently all observables defined for a quantum system system have definite values at all times, and ii) does not depend on the measurement context, meaning that it is independent of previous (or simultaneous) measurement of any other compatible (i.e. co-mensurable or commuting) observable. (KS1) All members of M simultaneously have definite values (for observables A, B, C, the seal be represented by v(A), v(B), v(C)). ii) Product Rule -> if A, B, C are all compatible and C = A·B, then v(C) = v(A)·v(B). In the original KS proof 117 vectors on a three-dimensional complex Hilbert space are required (see here for details). A considerable simplification of the original Kochen–Specker argument derived by Mermin (and Peres) uses a 3 3 square of observables Aij with possible outcomes v(Aij) = 1, on a four dimensional Hilbert-space of two spin 1/2 particles (details are given here). Note that this particular version of the KS argument is state-independent. From these equations the following measurable Bell-like inequality can be derived: , which was tested applying the neutron interferometric setup depicted below. The experiment was carried out at our instrument S18 at the high-flux reactor of the Institute Laue-Langevin (ILL) in Grenoble, France. The entanglement of spin and the path degrees of freedom of single neutrons is prepared using an RF flipper in one of the two beam path of the neutron interferometer. The three expectation values required for the proof were obtained in sequential measurements. In particular, one of the expectation values was derived from a Bell-state discrimination method. The observed value of clearly confirms the conflict with NCHVTs and are published in Physical Review Letters 2. In a prior experiment 3 the measurement of was accomplished by measuring . However, this method is unsuitable, because that measurement gives only the value of the product .